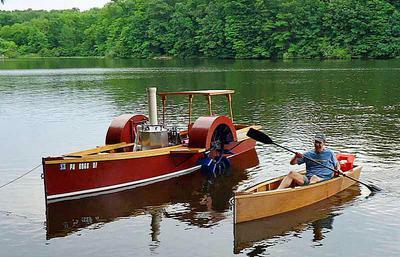 My Boat 19ft-3in Steam Sidewheeler. First boat I have built, although planning to build for nearly half a century. Comments for 19ft-3in Steam Sidewheeler. Mike is right , actually. I`m using " BoteCoat " premium Australian made epoxy , one of the most popular and trusted epoxies in this country . Amine blush washes off with water. I would get a scraper and remove that varnish and wash the surface , then lightly sand and re- varnish. Epoxy will not only chalk under ultra violet rays , in time it will yellow , become brittle ( weak ), and lose adhesion.Can you tell us what the brand name of the product ( varnish ) is ? It will determine what to use as a stripper if you want to go that way. "better to just sand it off?" The varnish is well adhered in some spots, then flakes off on others. I cleaned up the epoxied surfaces with acetone before varnishing, but have very inconsistent results. Every few inches there are patches of varnish that I can peel away with a toothpick, then right next to those patches, varnish so well adhered that a sharp steel chisel is needed to scrape it loose. Sanding will take me about 60-80 hours work, especially where there are corners to be sanded out, which is the entire perimeter of the boat deck. I want to do it in a few hours. "amine blush’ left on the epoxy?" No amine blush, epoxy is excellent, but not UV resistant. So the question remains: What brand of Varnish stripper is available that will not remove the epoxy? As the varnish hasn’t adhered well wouldn’t it be better to just sand it off? Personally I don’t like using chemical strippers at all but that’s just a personal thing. Is the reason that it didn’t adhere due to the varnish or could there have been some ‘amine blush’ left on the epoxy? A good sanding should get rid of any loose varnish and any ‘blush’ and create a good ‘key’ for subsequent coats of varnish. I put clear Epoxy on my Mahogany decks, then brushed over with UV resistant Varnish. The Varnish has poor adhesion in many places, and I want to strip off all the Varnish and start over. What brand of Varnish stripper is available that will not remove the epoxy? I have seen them advertised but I haven’t used any of these UV resistant epoxies. I’m a cynical old fart, so I tend to take all advertising with a pinch of salt. The UV protection in varnish has a “sell by date”, for it to remain effective it needs to be ‘topped up’ regularly. So I would assume that the same applies to the epoxies (?). If that is the case wouldn’t it be simpler to stick (no pun intended) with a good quality varnish that can be refurbished once (or twice depending on the conditions) a season? Two things I like about the epoxy, it goes on thick and floats out a nice surface in one coat. I put the UV varnish over that because I am told the epoxy will eventually become chalk like if not UV protected. But the varnish does not adhere well, and even if it did, recoating would be required often. I am hopeful the UV epoxy will last a long time. The non-UV epoxy I already have on the hull, with weather/sun exposure, looks good after 3 years, but I trailer the boat, and it is out on the water only about 8 days a year. I plan on using the boat much more now that I am approaching retirement. I understand there are UV resistant epoxies now available. Does anyone have direct experience with this, and if so what brand is worth purchasing? Steam has that "something" an internal combustion engine lacks.